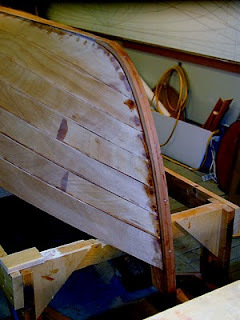 Work continues on the boat, albeit at a snail's pace, it seems. I finished the planking (!) and then set up a form to laminate the outer stems. 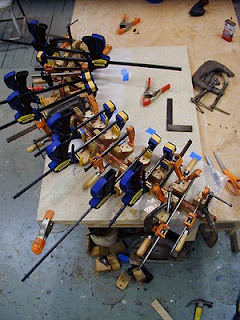 I keep a stash of "L" shaped blocks for laying up curves. 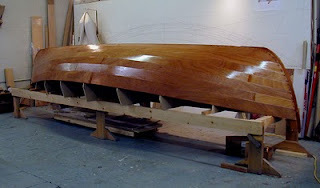 I've used these same blocks to laminate curved, half-wishbone booms for a Herreshoff 31 (cat-ketch), and also for curved outrigger cross beams on my sailing canoe, and now for the peapod stems. They were just hot-glued together, but have held up well! 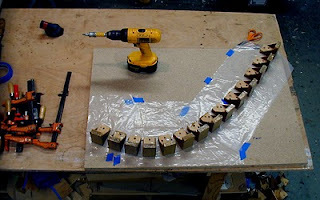 I used the original mylar stem loftings to generate the curves, and screwed the forms down to my bench along the curve. Plastic keeps the layup from sticking to the bench. I dug around in my scrap piles, and found some nice rips of Honduras mahogany which I re-sawed into strips about 3/16" by 1-1/2". I dressed these down to a tad less than 1/8", and bent a stack around the form dry, to make sure the whole lot would take the bend. Each stem required 7 strips, to finish out to 13/16". After laminating, I dressed the blanks down to the stem siding of 1-3/8", and tried them out on the boat. I had to tune up the inner stem and plank hood ends slightly to get a good mate with the outer stems. I left the outer stem blanks un-tapered until after gluing and screwing them onto the boat. I should have done it before glue-up though, because it was much harder to do in place than it would have been on the bench! At the same time that I was fitting the stems, I also fitted the outer keel, and glued that up as well. 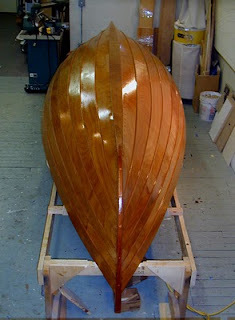 With all the planks, stems, and keel now in place, I gave the whole boat a coat of epoxy. I will still have a little fairing of the scarfs to do, and I want to run small fillets at the plank laps. A coat of epoxy will help when sanding and fairing, because it hardens up the wood, and keeps the sander from dishing out hollows in the softer wood around the filled scarfs, and screw holes.